With the publishing industry in freefall, what is going to happen to science fiction books? I asked Tor Books senior editor and manager of SF and fantasy Patrick Nielsen Hayden. He thinks the changes coming will be slow but weird. io9: With the rise of digital books, is the printed book going to disappear? Patrick Nielsen Hayden: I think print books will continue on into future. In my own life, I've seen myself ramping up the amount of text I consume digitally. For me, it's the weight and inconvenience issue - I want anything that will spare me having to carry around reams of paper. I'm not one of those people who says, "I could never read off a screen." I read an entire novel on a Palm Pilot in the 1990s. That's when I started reading e-books. It was great. The small visual inconvenience of e-books is made up for with find and search functions, and the fungibility of digital text. My authors deliver manuscripts to me electronically – I encourage that. I will be happy if I never have to carry around 500 sheets of 8x11 paper ever again. That's me, and I process text for a living. Nicholson Baker had an article in the New Yorker where he ruminated about the Kindle. He quoted somebody saying it was "like reading a wet newspaper." I don't have a Kindle but I'm on my third nonfiction book on the iPhone. I read work stuff with the Office app, and take notes with SimpleNotes app. io9: Where do e-books fit into Tor's plans for publishing going forward? PNH: E-books are tiny single digit in book market. But they are increasingly logarithmically - they went from something like a 10th of percent of sales to perhaps 1.5 percent in a few months. For a long time, e-books were this thing we had endless meetings about and which yielded laughably tiny sales, which led me to believe that e-books were like the old joke about Brazil, that it's the country of the future and always will be. io9: But do you think you'll start moving into publishing electronically more aggressively? PNH: We've been acquiring e-text rights as part of the default contract since the mid-90s. In mid-90s we needed to be sensible and we revised the contract to include electronic text. Now we have that as a clause. We won't buy a book without e-book rights. So we have these rights, and we do make a lot of our books available on the Kindle, but there are a lot of logistics involved. Basically we're on the case, but at the moment there are a lot of factors that go into deciding what's available for Sony or Kindle and Barnes and Noble. Tor.com was a place where people complained about lack of availability of e-books for a while. Before we launched the site we had this free e-book giveaway and people thought Tor.com would be all about e-books. But it really wasn't. E-books are phase B and C.
All the way from [Tor parent company Holtzbrinck in] Stutgart down to us, the conglomerate runs on the assumption that there will be changes in the next two decades and we don't know what they are. We're not locking ourselves into a platform. We don't want to let one player become choke point; we don't want to be a hapless manufacturer in the thrall of Walmart or something. io9: Does it make a difference to you if an author has an online reputation? Does that go into your decisions to acquire books? PNH: Obviously it makes a difference if an author has a public online profile of some sort, even just down to the level of having a moderately popular blog. Most books sell 5, 10, or 15 thousand copies. Most are midlist books. With those people, even a modest online presence can make a difference in sales. io9: Thinking science fictionally, what do you see happening to SF publishing over the next few decades? Will we still have novels? How will we read them? PNH: In 1991 or 92, I registered tor.com, and it was originally a gopher server. So I don't know what the technologies will be - I didn't know what 2009 would be like in 1989. I could have vaguely predicted io9, but not 4Chan or internet memes. One thing I'm sure of is that we're going to be in linear immersive narratives that produce the reading trance. We won't be moving towards a "choose your own adventure" thing. People will do those things, but those are different art forms. There's something about immersive text that you can read in order - it's persisted through many technological changes. This fiction stuff works pretty well. It's been around a long time. I do think immersive fictional texts will continue but it's obvious already that there's competition for people's time. Our competition at Tor Books is BoingBoing or Salon. There's more text online in a week than you could ever process in your life. It puts people into a hyperconsumptive, hungry-for-text state. io9: Do you think serialization is one way we might go with online novels? PNH: We're trying online serialization with [new Cory Doctorow novel] Makers. Serialization was an artifact of 19th century technological limitations. Now it's a gimmick. I say why? Why can't I FTP it? io9: Will new online formats change the format of the novel? PNH: I have a severe Google Reader habit. I think people will use blog forms and twitter to contrive fiction. Here's an interesting thing online: The explosion of fanfic. I don't read much, but back in fandom 1.0 - zines - there were people writing Star Trek stories, but it was below the salt socially. There was a strong aversion to publishing amateur fiction because people felt that if it were any good it would get published professionally. If you were seeing an amateur SF story, it was partly an admission that it was crap and couldn't get published. But with fanfic, there's no ceiling on how great it can be because it's unlicensed and can't get published. It's often written far better than the stuff it's based on. I wish [fanfic could go legit]. For most of human history, remixing narratives in circulation has been how culture worked. I believe in compensating artists, but yesterday [on a panel at WorldCon] the "moral rights" thing came up, and I think that's horseshit. I think artists should be treated well and so should waitresses and plumbers. Artists shouldn't have "treat them extra nice" rules. People experience art socially. People say "Watch this! Read this!" We experience art and we want to talk about it. I know that there are writers horrified by fanfic. Jo Walton hates fanfic. But in general I think with TV and the mass media world, somebody is going to figure out a way to encourage [fanfic] in a way that makes them a pile of money. 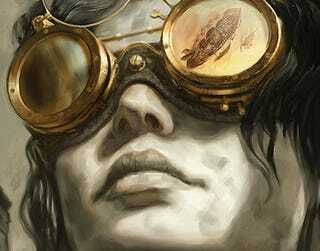 Art by Jon Foster from forthcoming Tor book Boneshaker.